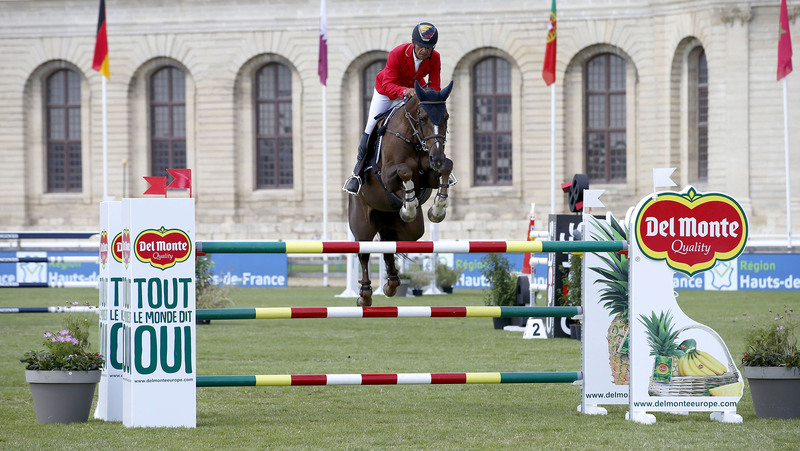 Carlos Lopez (COL) and Ulhane de Conde blazed to the final CSI5* Speed Class win of the Longines Global Champions Tour of Chantilly, taking top honours in the 1.50/1.55m Del Monte Masters. Lopez took the top spot by just two hundredths of a second from Pieter Devos (BEL) with Apart, and Denis Lynch (IRL) in third with RMF Fairview. The final day of competition at LGCT Chantilly was met with brilliant blue skies, as the spectacular Grande Écuries watched over the thrilling €93.000 jump-off class. Uliano Vezzani set up a fairly straightforward but technical 1.50/1.55m course, featuring some long related distances and a wide treble combination. The wall made a reappearance, the obstacle proving a real challenge in yesterday’s LGCT Grand Prix of Chantilly, as did the wide yellow and black Renault oxer, followed quickly by a Longines oxer with a bright blue water tray underneath. A six or seven stride option to the penultimate oxer caught out a few of the world’s best combinations and proved most influential, however fences fell all across the field. It took a while for the first clear to come, but Longines Ambassador of Elegance Jane Richard Philips (SUI) paved the way after delivering a brilliant round on Izmir van de Baeyenne, shooting her up to the top of the order. She would be joined by Christian Ahlmann (GER) with Take A Chance on Me Z who pulled off a masterful clear to create a jump-off. French hopes would be boosted with Julien Epaillard (FRA) and Safari D Auge looking light and agile as they flew around the grass arena to add their names to the jump-off list. Joining them would be Lauren Hough (USA) with Papa Roach, Martin Fuchs (SUI) with Clooney, Pieter Devos (BEL) with Apart, Carlos Lopez (COL) with Ulhane de Conde, Alberto Zorzi (ITA) with Viceversa de la Roque, Denis Lynch (IRL) with RMF Fairview, and finally Pénélope Leprevost (FRA) and Valdelamadre Clooney. So it would be a ten rider jump-off with French favourite Leprevost the final rider to go - a tantalising promise for the final French class of the season. Pathfinder Jane Richard Philips (SUI) set off at a fast pace, but agonisingly had the final fence down to collect four faults. A pole for Christian Ahlmann (GER) and Take A Chance on Me Z also dropped them out of the order, but the German put in a time of 38.96s, setting the bench mark for the field to come. French fans waited with baited breath, as speed demon Julien Epaillard (FRA) set off at a gallop with Safari D Auge powered around the course, coming on every forward stride but it was a chance too far and they took out a pole by coming in too deep to the oxer. Lauren Hough (USA) opted for a steadier time with Papa Roach, knowing a clear could put her in a strong position today. She checked to the last, making sure to clear the tricky fence, and shot to the top of the leaderboard but with a very beatable time of 48.09s. Young Swiss star Martin Fuchs (SUI) and top horse Clooney lifted off the brakes as they flew around the arena, taking 9 seconds off Hough’s time to set a real time to beat of 39.41s and putting the pressure on the field to come with their impressive time. Pieter Devos (BEL) took a daring stride out with Apart, with a check to the last to finish just ahead in 38.09s, raising the bar further still. The heat was turned up after Carlos Lopez (COL) with Ulhane de Conde took a long stride to the last, with a brave try pushing the duo just ahead by a few hundredths of a second to clock a new time of 38.06s. Alberto Zorzi (ITA) also opted for a steady clear with Viceversa de la Roque, riding through the finish gates in 40.94s and into the sharp end of the grid. Denis Lynch (IRL) looked up on time with RMF Fairview, but just checked to the delicate final fence, finishing just fractions behind the top two in 39.29s. The local crowd cheered as the final rider to go, Pénélope Leprevost (FRA) and Valdelamadre Clooney - a fairly new partnership - entered the arena for a last try of the day. Despite the large striding horse eating up the ground, France’s sporting hopes would rest on the FIFA World Cup today, as they fell short of the win, jumping clear but stopping the clock in 40.17s and finishing in 5th overall. So it would be a win for Carlos Lopez (COL) and Ulhane de Conde, with Pieter Devos (BEL) and Apart taking second and Denis Lynch (IRL) with RMF Fairview in third. The Longines Global Champions Tour season now heads to Berlin, for the 12th round of the Championship race.